Mid Height Eco Digipaks are the latest trend in eco-friendly CD packaging and replace the plastic jewelcases. Choose from biodegradable fiberboard or recycled content (70-100%), coated or uncoated paper stock. These are custom manufactured - we can make your package any way you like! Recycled Paper stock is almost indistinguishable from regular paper stock in appearance. The more the recycled content, the softer the feel. Recycled can be ordered in coated or uncoated stock to suit your art. Optional Fiberboard paper stock gives packages a rough texture. Material is very absorbant and results in a soft, organic look. You can use the natural unbleached paper color as part of your art, prints colors directly on it for a muted effect, or print with a white area to help them stand out more. Digipaks use a clear CD tray to hold the disc. The panel underneath is printed as well. If you have a multi-disc title, we can use multiple trays. 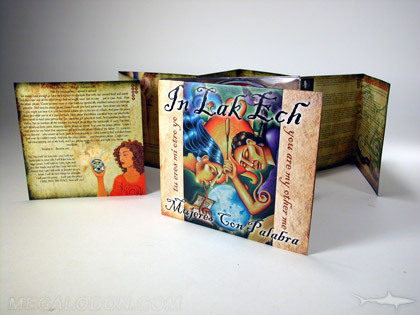 Digipaks can be 4 panel on up to 10 or 12 panels or more. Slipcases (printed 4C) are a great addition to wrap these. Booklets are easily added with slots, thumbhole, or tube pockets, or literature slots. Other Custom Tray Type Product, such as Extra Wide Panels, Tall Panels, More Panels, etc. Use Project Notes below.